The apricot has been consumed since ancient Chinese times for its supposed fertility enhancing abilities and popular taste. Find out more about its many culinary and medicinal uses. Famously portrayed in William Shakespeare's work, the apricot is actually believed to have originated in ancient Chinese times. After its production spread across Asia, this stone fruit was brought to North America, where its successful production began in California. 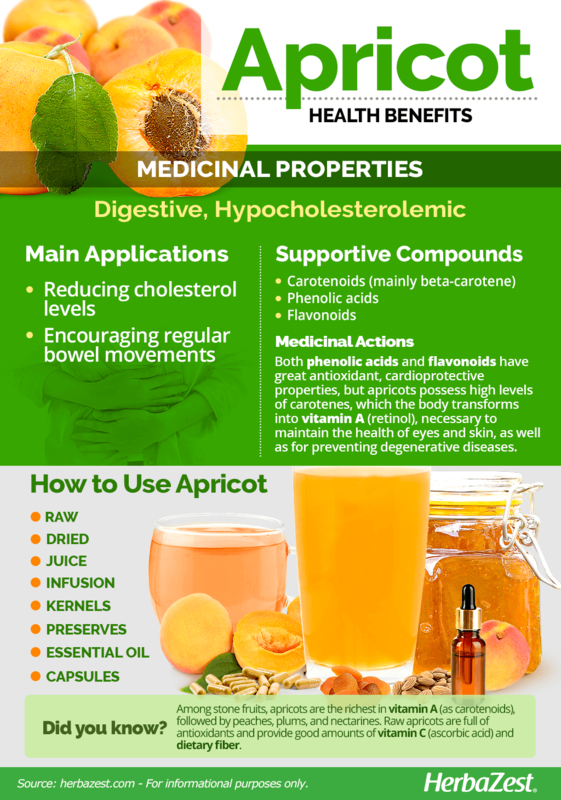 Today, the apricot is known for more than just its savory taste as it is used in various medicinal ways. Reducing cholesterol levels. Apricots are high in beta-carotene and fiber, which contribute to reduce the harmful LDL cholesterol levels that cause arterial inflammation, thus helping prevent heart disease. Encouraging regular bowel movements. The high fiber content found in the skin also helps reduce blood pressure and aid regular bowel movements. Aiding in gastrointestinal problems. 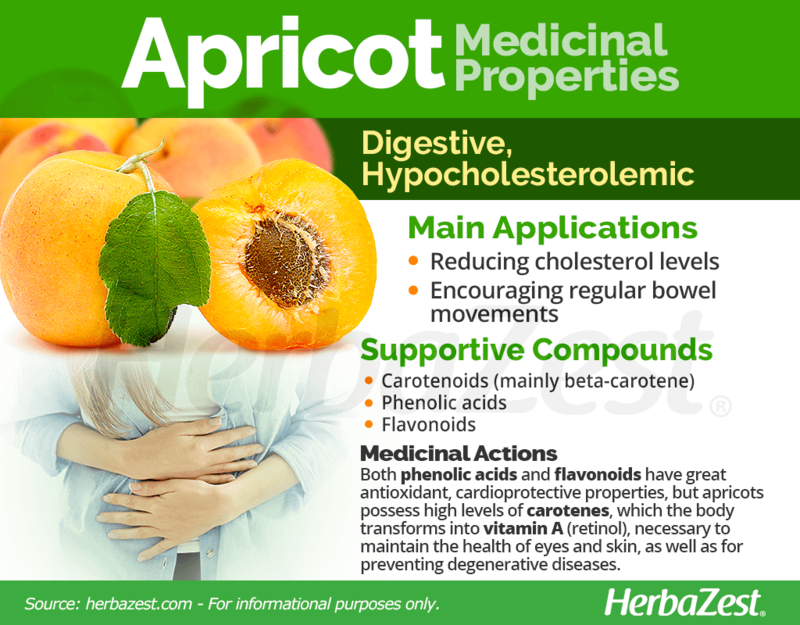 Apricot kernels have been proven to help with gastric problems, such as inflammation, and act as a carminative and laxative. Assisting with ear problems. Kernel oil drops have also proven beneficial in remedying otitis and tinnitus. Apricot consumption has increased in popularity due to its impressive nutritional profile. Like other Prunus species, apricots are rich in phenolic compounds, which have great antioxidant, cardioprotective properties, but boast the highest levels of carotenoids, necessary to maintain the health of eyes and skin, as well as for preventing degenerative diseases. Among stone fruits, apricot is the most abundant in carotenoids, followed by peaches, plums, and nectarines. Other herbs with digestive properties are oregano and sage, while olive and avocado also help reduce cholesterol. Apricots are mostly safe when consumed in moderation. However, eating too many apricot kernels can trigger mild to severe side effects, including vomiting, headaches, nausea, dizziness and other conditions of generalized weakness. This is due to trace amounts of amygdalin in the kernel, a naturally occurring cyanogen that can be toxic. The cyanide content of apricot kernels varies and depends on several factors, including chemical components, cultivation practices, variety, origin, and more. Cooking or fermenting the seeds drastically reduces previous cyanide levels. Consuming kernels is generally safe for those who are allergic to nuts, as apricots are considered a stone fruit. Although, there have been some cases of clinical cross-reactivity in consumers with peanut and almond allergies. When eating apricot kernels, consumers are advised to take precaution. Those with preexisting health conditions, such deficiencies in vitamin B, iron or potassium, should consult a health professional before consuming apricot kernels - ground, crushed or any other type - to self-treat their deficiencies. This is especially true for pregnant or breast feeding women. Apricot kernel oil is mostly safe when applied topically. However, it may cause skin irritation. Apricots are a good source of vitamin A (as carotenoids), which is essential for growth and immunity, as well as for skin and eye health, along with vitamin C (ascorbic acid), which aids immunity and collagen production. Additionally, apricot provide adequate amounts of: copper, which promotes red blood cells production, as well as supporting vascular, nerve, immune, and bones health; vitamin E, essential for cellular functions and plays an important role in enhancing immunity, as well as for preventing the formation of blood clots; potassium, important to the well-functioning of nerves and muscles, as well as for supporting cardiovascular health by regulating heartbeat; and vitamin B5 (pantothenic acid), a precursor of coenzyme A, which is required for the synthesis of proteins and fats. Furthermore, apricots contain small amounts of vitamins, such as B complex, K (phylloquinone), and choline; as well as minerals, including manganese, zinc, phosphorus, magnesium, iron, and calcium. 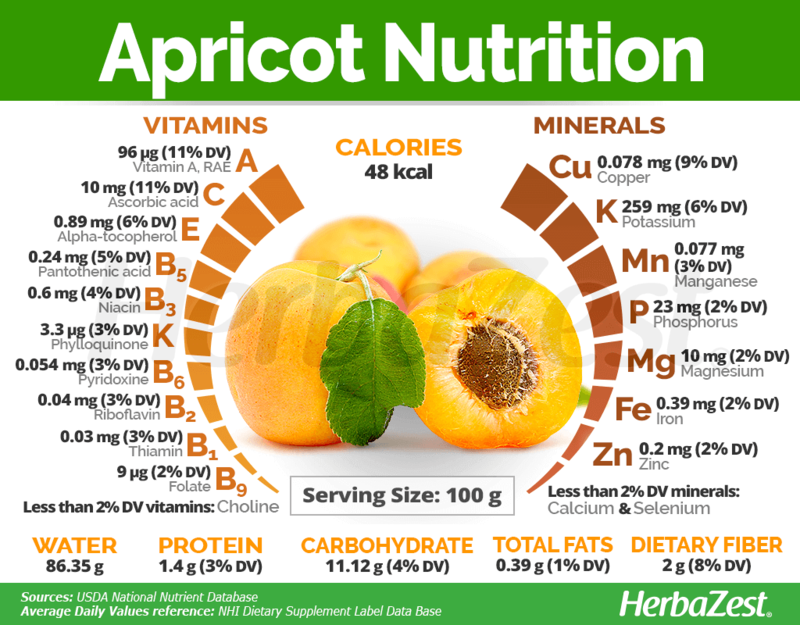 100 grams of apricots provide 48 calories and 8% of the daily value for dietary fiber. The most effective way of obtaining the health benefits from apricot is by eating it raw, due to its high vitamin and mineral content. However, there are a myriad of ways in which this stone fruit can be prepared and utilized. Raw and dried. In its purest form, raw or naturally dried apricot is an antioxidant fruit, full of vitamin C, beta carotene, potassium, and fiber. Raw apricot can ease gastric inflammation, aid digestion, and act as a laxative among other benefits. Juice. Besides its fresh consumption, another easy way-of taking advantage of apricots' benefits can be through drinking their juice. Infusion. Brewed apricot is acclaimed for helping boost metabolism. Kernels. These can be ground and sprinkled onto food dishes and eaten plain as a snack. Preserves. In the form of jam, marmalade, or syrup, apricots lose most of their vitamin C but still offer good amounts of carotenoids and other essential compounds. To preserve apricots past the growing season, many consumers choose to can or freeze them. It's wise to do so as soon as possible after the harvest, and the skins of the fruits can be left on. Essential oil. Apricot essential oil drops can be used to help with otitis and tinnitus, as well as for skin care. Capsules. 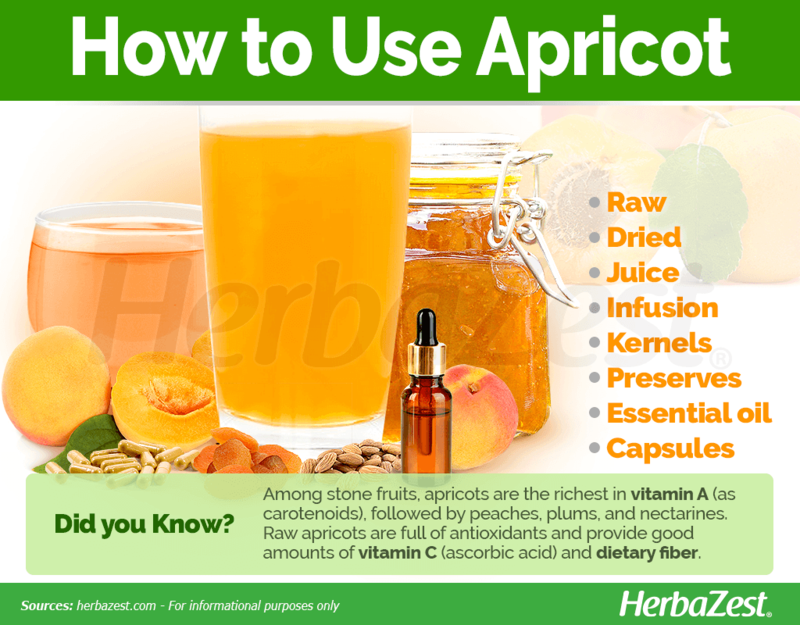 Many consumers choose to take apricot supplements to absorb the kernel's nutrients instead of eating the fruit itself. Raw apricots in North America are only available during the summer, from May to August. Although fresh apricots are most frequently purchased in grocery stores and supermarkets, as well as farmers' markets, they can also be bought dried, frozen, canned, and jellied. All of these other forms of apricots are available year-round. Apricot supplements are mainly found in specialized health stores. In addition, there is a wide variety of kernel capsules available for purchase online. Each brand may come with different concentrations; therefore, it's important to consult with a medical professional first on your health needs. Although, the high price of quality apricots often leads consumers to try to grow their own trees at home, which can be bought from local nurseries. CONTRARY TO POPULAR BELIEF, CANNED APRICOTS DO NOT LOSE MOST OF THEIR NUTRITIONAL PROPERTIES AND CAN BE EATEN IN LARGE AMOUNTS. Growing apricot trees requires very specific conditions. They grow best in dry areas, where little rainfall benefits them at blossom and maturity. Also, it's important to plant apricot trees in deep, well-drained, silt or sandy loam soil. New trees should be planted in early spring in a site where there is full sun and protection from high winds. Young stone fruit trees, such as apricot trees, require about one to two inches of water weekly. As the tree ages, less water is needed but is still important. Apricot trees will begin to bear fruit in the third or fourth season after planted. Harvesting usually occurs in the end of July and through August. There are two primary methods of propagation for growing apricot trees - sexual, which is the propagation by seed, and asexual, which consist of vegetative reproduction. The most common diseases that attack apricots include coryneum blight, gummosis, and perennial canker. Popular pests to apricot trees are the greater peachtree borer and the peach twig borer. Detailed information about growing apricots can be found in the herb garden section. Standard apricot trees can grow 20 - 30 feet (6 - 9 m) tall. While in ideal climates apricot trees have a lifespan of 75 years, in North America that period is shortened to 15 years. The leaves are oblong and two to four inches (5 - 10 cm) in diameter with a pointy tip. Blossoms are light pink in color and reach a size of about an inch. As an apricot ripens, it changes color into a fleshy yellow or orange fruit. The skin is smooth or covered in tiny hairs depending on the variety, and the kernel - the single seed inside - is protected by an outer shell, called the stone. The number and types of cultivated apricot varieties range depending on the growing region. Some varieties include 'Harcot', 'Veecot', 'Hargrand', 'Harogem,' and 'Harlayne.' It's important to keep in mind that even in the best environment, apricots are still only considered marginally commercial. Apricots are believed to have originated in China over 4,000 years ago, where they were called Moons of the Faithful. This stone fruit was thought to enhance fertility. Spanish settlers are to credit for bringing the fruit to the New World, where successful cultivation in California began in the late 1700's. Apricots are grown worldwide in many Asian countries, the Middle East and the Mediterranean, with North American production happening primarily in California. The state leads the nation with 95% of the total U.S. production, and the United States, in general, produces close to 90% of the world's apricots. In ancient Chinese times, apricots were believed to enhance fertility. This stone fruit was also considered an aphrodisiac in Europe, a belief enhanced by William Shakespeare's A Midsummer Night's Dream. And to this day, apricots are believed to induce child birth, as was shown in John Webster's The Duchess of Malfi. Cosmetics. 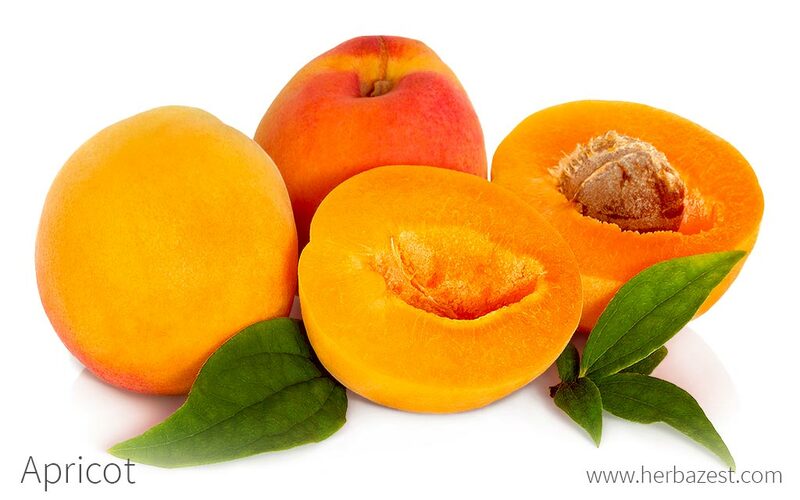 Apricot kernel extract is often used as an ingredient in personal care products and DIY cosmetic recipes. It can also be used as a less expensive substitute for almond oil in some instances.